This process was annoying, but still relatively straightforward. First of all we found a website, run by a couple of Aussies, who wrote this guide about getting a Chinese visa in Hanoi. Their website was very helpful – which is probably why they’re quite famous and are getting money. Anyway, we experienced a similar situation to them, but we had the extra fun of having to supply our ENTIRE itinerary in written form including all hotels, transport, and entry and exit dates. We asked for a double entry (30 days, exit, 30 more days) and the grumpy woman behind the counter reacted as though we’d ripped off our clothes and begun uncontrollably whooping. Why, in god’s name would anybody require a double entry into China? her expression demanded. Well, if three months wasn’t long enough in Vietnam, one month certainly was not going to be long enough in China – a country ten times larger. We told her we wanted to visit Hong Kong and then go back to China. She was still flabbergasted, but decided that it would be okay if we added the details of our entry into Hong Kong and exit back into China. We would also have to provide the subsequent cities we’d be visiting before leaving the poor country in peace. As this point, let us just say we gave the bureaucrats what they wanted and secured our two-month double entry visas in China. There are two train stations in Hanoi: one that is quite close to the Old City (which is where most tourists stay), and Gia Lam station which is 5 kilometres away over the river. 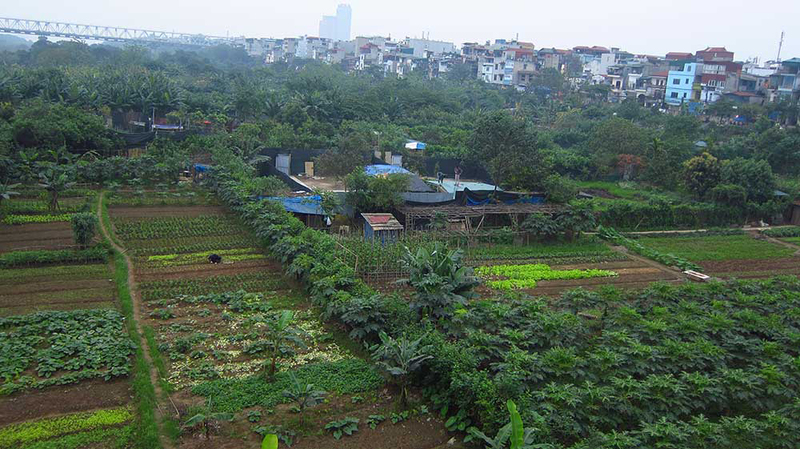 Guess which station the Hanoi to Nanning train leaves from. Since we hadn’t really done it in a while due to having a motorbike, we decided to walk to the faraway Gia Lam station. And what an interesting walk it was, crossing over the long, rusty train and motorcycle bridge. The bridge was just as vibrant as anywhere else in Hanoi with people selling food, jogging, driving the wrong way, or just walking out to admire the view. The constant rattle of honking motorbikes kept the bridge in an alarming state of constant jittering, and the rusted railings did little to make the casual walker feel secure. It was fun. 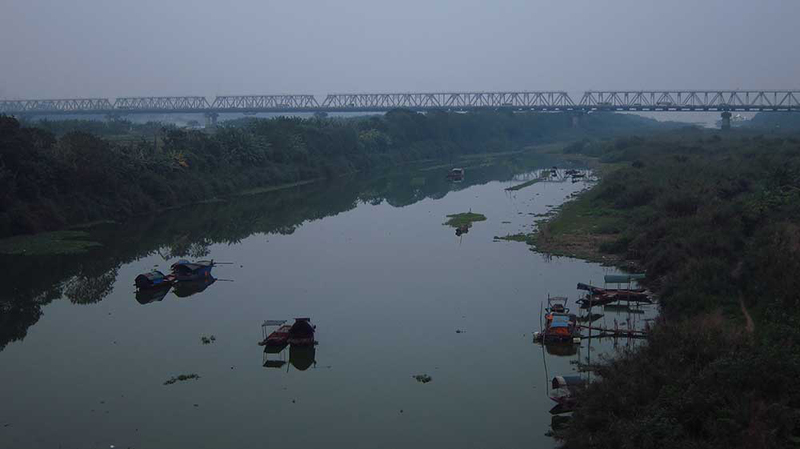 A view of Hanoi’s car bridge from the train bridge. We’re gonna build a pineapple wall! And China’s gonna pay for it! The other side of the river felt a lot more like the Vietnam we’d seen elsewhere in our travels. It was a thrumming hub of food and fashion, fashion and food. The streets were alive with late-night school kids, balloon sellers, babies in arms, mobile karaoke machines, wild men’s haircuts, and distracting LED lights. There wasn’t a North Face outlet in sight. We sat in a shop called ‘Feeling Tea’, and the girls behind the counter gave us the password for the neighbouring shops Wi-Fi since (presumably) they hadn’t paid for theirs. 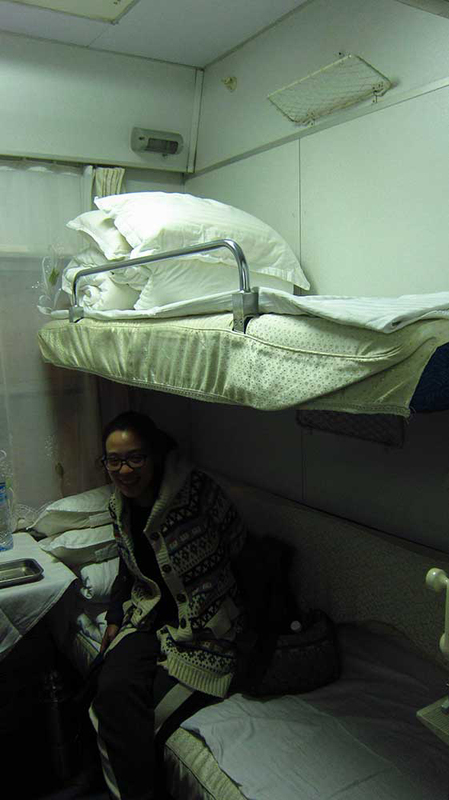 The train was certainly a step up from the Myanmar sleeper trains, and the 4-berth booths were a little bit more private than the Thailand sleepers. The bedding was comfortable and cushy, the temperature was nice (unlike the freezing Thai trains) but none of the power outlets or private lights were functioning – at least not on our side. There were a couple of shared toilets at the end of each coach – squatting, but clean enough. A peculiar pair shared our cabin; a 40-50-something Taiwanese man and a 36-year-old Vietnamese woman. They seemed to be a couple, but couldn’t speak each others languages. They acted like strangers would, but at one point they held hands – like strangers would not. “Very sick,” said the woman as she sniffed and pulled her face mask on. The man quietly played buzzing beeping games on his small tablet. 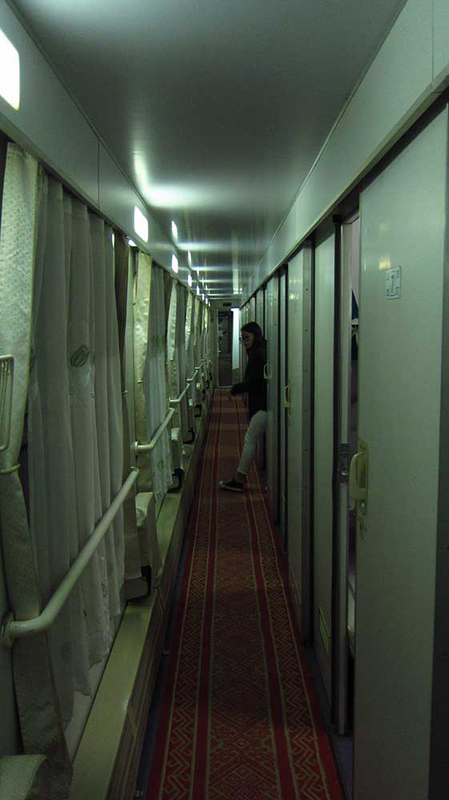 I was the last to fall asleep in our cabin and turned the light off at about 11 p.m.
At exactly 1.00 a.m. the train stopped and the sleepy passengers were ushered off to get their exit stamps. A couple ahead of us in the queue got into a disagreement with the guards – we think it might have been about cigarettes. The man was told to move to the waiting area while they spoke to the woman, but he refused to budge. The guard yelled in his face but the man remained firm. Then the guard shoved him with both hands sending him reeling back. Words were exchanged. The guard shoved him again, then the man resigned himself to sitting in the waiting area. We all returned to the train and fell asleep again. At around 3.30 a.m. we were woken again. This time we were ushered off the train and into Chinese immigration. Men in full military gear (with helmets and riot shields) rifled thorough people’s bags half-heartedly. When Caroline reached the gate, the passport officer asked her a few questions in Chinese (which Caroline did not understand). Her passport seemed to confound him. He talked to another officer who in turn walked off with her passport, telling Caroline to wait at the side. Then it was my turn. I was using my older British passport, and the officer had the same confused look as he leafed through the pages. He turned to Caroline who was still waiting. “Yes.” I said, and dug out my brand new, never-been-used NZ passport which I’d picked up at the NZ embassy in Hanoi. He scanned its empty pages. He then asked another officer to take both of my passports away and instructed me to wait with Caroline. Soon, he returned with Caroline’s passport, stamped it, and she carried on through immigration. I remained standing in my naughty corner as everybody else passed through immigration without worry. On the other side of the gate, they wouldn’t open the doors to let people back on the train until everyone had cleared the inspection. Soon, I was the only person left on the wrong side of the gate. I could see a lot of tired Chinese people looking accusingly at me. Through a little window I could see three guards running my passports under UV lights and making phone calls. One guard came out and asked me to sign my name on a bit of paper. Now here’s the thing. I didn’t really ‘have’ a standard signature until about seven years ago, so in my 8-year-old British passport my name is just kind of scribbled in there. My customs declaration form and my NZ passport contained my (I suppose ‘new’) signature, so when they asked me to replicate the older one I couldn’t do it. If something looked dodgy before, my failing to write my own signature now certainly didn’t help things. More scanning. More UV lights. More phone calls. More accusing looks from the other passengers. Concerned looks from Caroline. But eventually, for whatever reason, they gave me back my passport and let me go. I suppose I am on some list now. This was it, our first taste of a Chinese city. We rolled in at about 10 a.m. to the site of gloomy, rather depressing buildings and the same foggy haze that was currently blanketing northern Vietnam. Clearly this was not a city frequented by tourists, because we weren’t bothered upon exiting the train station. Although the high rise towers were dismal, it was very exciting for us to be in a completely new culture. The people behaved differently to the Vietnamese – they spoke with quieter voices; they walked with their heads down; the cars actually stopped to let people cross the road; we weren’t relentlessly stared at. Perhaps the most striking difference was that petrol-powered bikes are illegal in the city, so there is hardly any traffic noise as thousands of electric bikes whiz around silently. You can hear people chatting and birds singing. It’s possibly the most peaceful big city I’ve ever been in. Our goal was to make it to the university where we would be meeting Nancy, our couchsurfing host. We would stay with her for a few days and in that time buy bicycles. Our plan is to ride these bicycles to Hong Kong. But those stories will be told in future posts. I’m doing this journey on the 6th of April. Just wondering if you need anything other than your passport with visa at the Chinese immigration. We had proof of onward travel etc but the visa office didn’t give them back. Also as you enter after midnight is the stamp from the later day? We only needed our passports with valid visas, but at the immigration area you will be required to fill out a declaration which includes filling out one address for your accommodation. We didn’t have to give any proof of this accommodation. And yes, because you’ll be actually exiting Vietnam after midnight, you’ll need to board the train the day before your visa expires. Hey, is it possible to take your motorbike on the train from hanoi to nanning? I’m pretty sure you’re not allowed to do that. 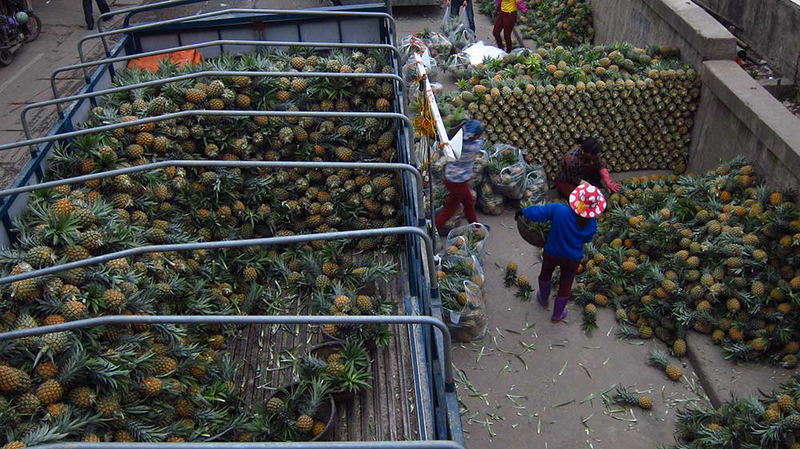 It might be best to check with the Chinese embassy and the Vietnamese rail services.